Just me today sadly, poor Carol had to go to work and I had a job interview in Bristol, so although she was not with me physically, she was with me in spirit and here is why. I took Sylvie to Bristol this morning so I could get to my interview with a company called Mantra, this involved a quick dash up the M5 to Bristol, a quick skoot along the A4 and a sudden stop in a car Park in Baldwin Street. This was all undertaken before nine AM this morning and it was a pure joy to be up and riding at that time of the day. I wont lie to you and tell you that the roads were empty, because they really were not, but it was so cool, the day's heat had not yet risen and the sun was not yet at it's zenith. Getting from the flat to the motorway was an unusual adventure for me in that I chose a route, found my way there and did not hit traffic until right up until the turning onto the A370. Once in the standstill traffic though, I just filtered slowly through. Carol taught me that to filter is a dangerous and cunning art form and I actually really enjoyed it. I got to the front of the traffic queue and turned onto the motorway. Riding on the Motorway is not particularly exciting, it is windy, pretty straight and too fast to actually be fun. Riding B Roads at thirty to forty mile per hour is technically more demanding than riding on a motorway at motorway speed (I say motorway speed, because they are not always 70MPH) and considerably more fun to boot. I am still learning how Sylvie corners and to feel her dropping in on one side and then swooping over to the other is exhilarating and you do not need speed to feel that. Maybe this is because I am still learning how to ride her, but Sylvie at lower speeds is a beautiful bike to have control over. The Motorway quickly gave up the miles to Sylvie's wheels and then the traffic bunched up, with the inside and second lane of the Avonmouth fly over being full of trucks. I managed to get into the second lane and saw my exit, but it was blocked by trucks who were nose to tail, there was barely enough room between them for a Rizla paper, let alone Sylvie and I. So we sailed past our Exit at the great speed of sixty eight miles per hour and headed up the road to the next exit to turn around. It added an extra four miles to our journey and only a few minutes. The A4 was clogged from the outset for us and once again Sylvie's beautiful slow speed handling came to the forefront as we slowly filtered through the traffic. Filtering is an art form and having followed Carol, I know that I still have a lot to learn. Today though I aced it and managed to filter slowly and surefootedly through the slow moving or still traffic. At one point I caught up with the ZZR600 that had over taken me on the entry to the A4 and kept pace with the Blue haired rider until I managed to pass them. Filtering is about confidence and taking an opportunity that exists for less than a second. Slipping through gently and with ease. I had one moment when I decided to let discretion be the better part of valour on the road going past "At Bristol", when a truck needed extra room to turn around a bus, but I soon passed the obstruction and was once again on my way. Once into the centre of Bristol I headed around to Baldwin Street and found a Bike park with a nice steel railing to lock Sylvie too. I do not like the idea of leaving Sylvie unprotected in a busy city and so she had disk locks front and rear as well as a chain and a D-Lock. She also has her steering lock and her alarm just to keep filthy thieving hands away from her. Not sure I mentioned it, but I love my girl Sylvie. Then came the interview. Forewarned is forearmed and Carol did some digging into Mantra Marketing for me, because she is good at stuff like that. The job advert I had applied for was looking for a Media Sales Executive, sounds posh does it not? The job they interviewed me for was selling door to door... You know those dodgy types who ring your door bell, then stick their foot in the door so that you cannot get rid of them, well that is the job. I was less than impressed. The sting comes in the pay packet, if you work really hard and walk an entire street, knocking on every door and get rebutted at every step. You earn nothing. If you find a little old lady at home and intimidate her into buying some rubbish she does not want, you earn fifteen pounds. The people at the interview all have a similar look, keen, confused and young. Well except the guys who are obviously out of work sales men in their fifties. The woman interviewing me was hideously pretty, one of those people who should be beautiful, blonde, petite and with a big smile. I felt like I was swimming with a shark and a hungry one at that. She apologised to me for wasting my time and wished me bon voyage home. I left that odd place and was stopped outside by a young man who had the distinct hippy look to him. "Excuse me I am looking for the Krishna centre?" Oh yeah, the same office and phone number as Mantra... Scary. I took Sylvie over to see a dear friend to Carol and I, a lovely chap and engineering genius known as Wayne. Seeing him in the garden working his magic on his ZX10 project is a joy to watch, but today he was working on his Dad's Fazer 600. Yesterday he hit some thing big and hard in the road and damaged both wheels beyond repair. So he took them out, took off the disks and ordered new ones. It was a shame to see him looking so down. Luckily it is hard to keep a spirit like Wayne down and he was soon happily playing with Titanium bolts for his race bike. The ride back to my beloved Carol was very nice and took in the road between Bristol and Clevedon, a lovely winding road with a forty limit, heaven in tarmac form. I had ridden this road a few days before, but had got stuck behind a large articulated lorry, which was in turn stuck behind a large old tractor. No chance of filtering past those two on that day. Today though the road was clear and swift. I did not hit the speed limit of because the corners are rather tight and with out knowing what is on the other side of them, I would hate to go flying round and find a traffic queue. However, I was still faster than anything else on the road and was only caught when the rode finally entered Clevedon itself and more traffic queues. A quick blast down the motorway and I was soon in the arms of my beloved Carol. I was tired, I was aching from the ride and I was heart sore at being apart from her. My girl is beautiful and her smile is enough to make flowers want to blossom or birds want to soar. She was waiting for me and she treated me to the lunch of royalty, a Quarter pound cheese burger and chips. We sat together in the sunshine, holding hands and basking in each others love. Did I mention that I love my Girl? In truth I love both of my girls, Carol is my life partner, my soul mate and my friend and Sylvie is our bike. With both of these gifts from the gods in my life, it is hard to be unhappy for long, even after a wasted interview. Well there is so much to tell you since we last spoke. This weeks event started with an argument between Carol and I. Who was going to ride the Honda CG? As a dyed in the wool biker, it would not look good for Carol to turn up to bike night on a ratty training bike, however, whose Suzuki is it? So after a game of paper, scissors, stone, Carol just thumped me and I learned my place! Actually, Carol is my lass and she looks great on the SV. I can hardly show her off if she is on the little bike, it also gives my neck a chance to recover from riding the Suzuki's clip on bars. As for Bike Night, what an evening out that was. I had heard from a few folks on the SV forum that they were going to take a ride over and come and say hello. Leading the pack would be Gruntygiggles and her other half Stretchie. 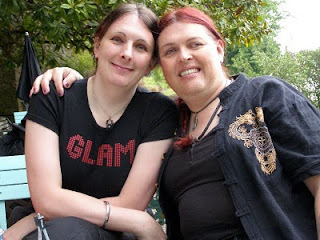 Not having met these people before, I was a little shy as always, but they were both really lovely people. Tagged along with them were half of the South West area SV owners, ( Squirrel Hunter, Beenz, BaP, BrisRob and a load whose names I can't remember) and old faithfuls Dan, (aka Metalhead), Stu (aka Nemesis) with his new and very noisy can and finally Lloyd, on his lovely Fireblade. After a brief stop on the sea front, we headed over to Scallys and just made it in time for the last of the Hog Roast. Well I say Hog Roast, when we got there, there was a pigs head on the cooker! Being a recent convert back to a carnivore life style, a pigs head was a little too much for me and I settled for a nice burger instead. 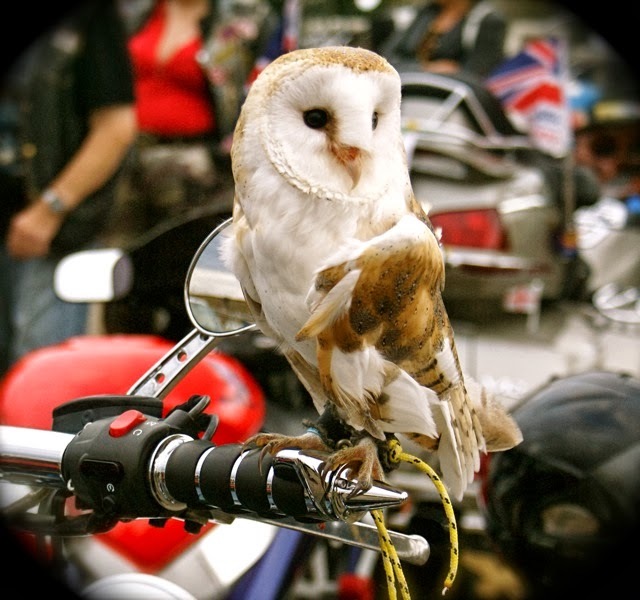 For those of you not familiar with Scallys, it is Weston's premier biker friendly pub and on Bike Night it is a great place to sit and chill after the heat and the chaos that is the sea front. 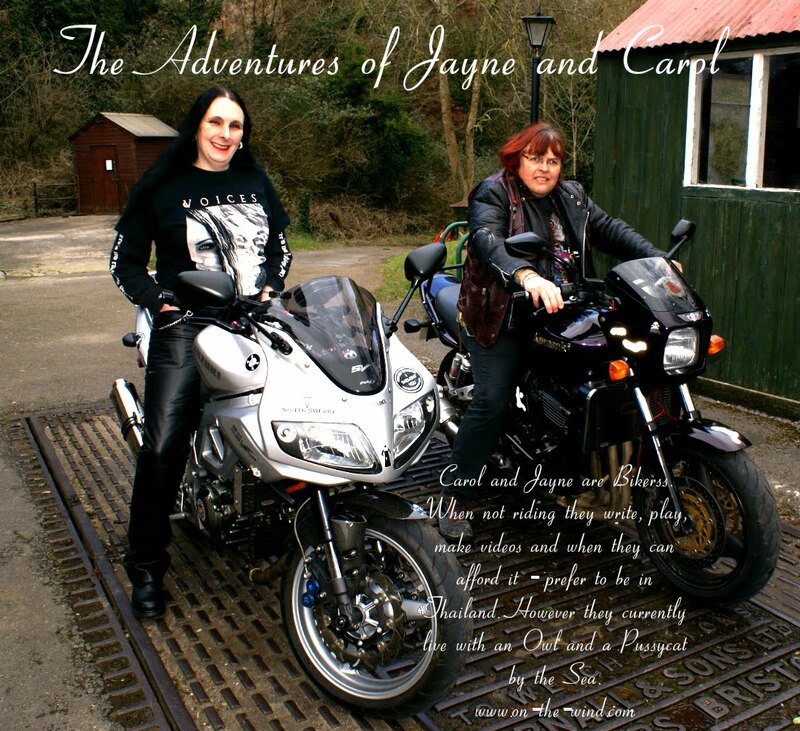 It is also a place where Carol can catch up with old mates and swap gossip, the funny thing about a group of bikers like this is that although they look dead hard and a bit scary, in club patches and leathers, they are actually a lot of fun and rather sweet. Carol deserted me at the pub and wandered off to chat to her mates, but I did not mind because I was with my new friends from the SV forum and we chatted until late into the evening. I was a little sorry to hear that one of the lads had had an off on the way over, but he was OK and the damage was minimal to his bike. Being a new rider myself, I can understand the fear of loose corners while going a touch too fast. After a while though, they all had to head back home to Wiltshire and when Gruntygiggles started her little Blade, there were appreciative comments the locals in the pub. It sounded like a Blade should, a steady growl that you knew would turn into a howl on the faster roads. Having waved them off, I went to find Carol and found her in a gaggle of bikers discussing the merits of a 33BHP restriction, yeah she blew my cover again and had told a load of hard bikers that actually, I am a little girly with a half power bike... Thanks for that Babe! The trip home was refreshingly cool after the days heat and One of Carol's mates had a lift on the back of Sylvie to enjoy some toasted home made bread and a nice cuppa. It is so nice to see Carol with her old mates, she tends to shine when she is happy, and tonight she was glowing. Thursday night rolled over into Friday morning and I had long since retired to bed. A bit of bad news dropped through the letter box, but it was nothing that could not be sorted by a ride out on the bikes. I prepped Sylvie and got Henry ready while Carol got the filming equipment sorted out. With one camera mounted on the front of Sylvie and another mounted on the rear of Henry, we could film each other riding to Cheddar and up the gorge. Well, that was the plan. Henry was poorly. He would cough and splutter and then he cut out. Carol pulled over and gave him a check over and he spluttered back to life. Half a mile down the road, he was poorly again and once again Carol had to pull over. This time she drained the Carb, thinking that there was contaminated fuel. The liquid, splashed out and steamed away on the hot engine. Funny, it did not look too much like petrol to me. After that Henry started, roared and Carol shot off down the road like a race horse at full gallop. Even on Sylvie, I found it hard to catch up. Following Carol is brilliant, even on a 125CC bike, she is fast and smooth. Following her lines on the road makes the bike feel like a thoroughbred and I will admit that I got a little scared. Even at road legal speeds, Sylvie can feel a little too much for me and I had to back off. Yes, I am a wimp for not keeping up with a Honda CG125, but with Carol piloting, Henry is a road racer. The rest of the trip to Cheddar was smooth and easy, however riding the clip ons was getting to a stage where my right hand went numb, we have a plan to sort this out with a bar conversion, but until we can afford the new brake lines, Sylvie will just have to make do with standard bars. Our arrival in Cheddar took us to the chip shop and we picked up lunch before loading it into Sylvies pack and then riding off up the gorge. Cheddar Gorge is beautiful and as a rider, one really must concentrate on the road and not the surrounding cliffs. As a Climber, all I wanted to do was pull over and get some serious climbing done, but since taking up motorcycling, climbing is on a back burner for me for a while, due to needing hundreds of pounds of new equipment. The quality of the road though more than made up for wanting to go climbing and some of those twisty sections were lovely. Well pulled off the main drag and headed over to a place called Velvet Bottom, the road looked like it was made of loose gravel, which worried me slightly and I slowed right down again. Sylvie may have big wide tyres, but that is of little use when the surface is moving about. Thankfully, it all seemed to be solid and I was able to find my rhythm again and could get back up to speed. Turning around at the top though was a moment and I had little choice but to mount the grass verge due to a narrow road. Sylvie was impeccably well mannered about it all and showed little signs of slipping on the mud and grass. We parked up in a layby and wandered off to enjoy our chips. After lunch we pulled our bike gear back on despite the heat and headed back down to Cheddar for a cuppa and an Ice Cream. The road back down was even more fun than riding up it, mainly because I had got used to the strange surface, I could still not keep up with Carol though and eventually we pulled into the Car Park in the village centre. As is the way with Carol, she immediately started chatting to the other bikers parked up and once again started to talk about learner riders. Once again I was outed for being on a half power bike and my street cred and cool oozed away. Thanks again Babe! It is a good job that I don't ride bikes to look cool, I ride bikes because I love to do so. The Scottish couple were on a long tour and loving every moment of the open road and the Guy with the Ducati was a local to Weston. after our Ice cream and cuppa, we decided to head home, both of us tired from the riding and the heat. After a day out like this, what was required was a nice session of skinny dipping in a nice cool clean river, sadly the River in Cheddar is a little open to public view so we had to make do with going home and having a nice shower instead. What a great couple of days out though, beautiful views, great roads and meeting some really lovely people, I doubt it can get better than that, although a big bike for Carol would be one way. If any friendly Kawasaki Dealers would like to donate a bike to her for our adventures, we would love you forever. The second Weston Bike night of 2010. Weston super Mare Sea front. 13/5/201. In aid of the Royal British Legion, run by the Legion motorcycle club. Sorry if the footage is a bit pixel'y. youtube is the main problem. But hope it does not spoil your enjoyment. The Surge and the Swell. Today was one of those warm days, with just enough heat in the sunshine to make it perfect for riding, well perfect for me anyway. Carol was at work today, leaving me at home with a heart full of adventure and a tank full of unleaded. So after a morning of dealing with the officious bureaucracy that makes up the local Government there was nothing more appealing than a trip out. Riding a sports bike is an art form and I am still only a learner, I may not be showing that big red L on the bottom of my number plate anymore, but these days I am more of a learner than I ever was. I am learning how to ride a 650 CC performance motorcycle smoothly and efficiently and it has it's moments that make my heart flutter with either fear or love. The fear comes when the bike surges forwards, which is odd because the love comes when the bike surges forwards. Cruising through Weston today I discovered that a third gear roll on is an awesome feeling, although cruising is not the true word, I was heading up the A370, to the motorway when a chap in a red car decides to undertake me in the fifty zone. Ahead of him was a van and I knew that he would have to pull out to get past the van, but at our current speed, that would mean pushing me out of the way. Not being keen on the idea of being a road Pizza, I gave the throttle a gentle twist. Fifty miles an hour to sixty five and back down to fifty. The car and the van now far behind me, the smile on my face and that indefinable feeling in my heart. For that brief moment, I was speeding, but the guy about to undertake me was driving badly and putting me in danger. Back at the speed limit, I was pootling along nicely. The drop on to the motorway involves another moment when the throttle is slowly opened and that exhaust note changes from a growl to a roar to a howl. Damn, I love the howl from my beautiful SV engine and to hold that note, I have to keep the throttle nicely open, the speedo reads between 68 and 71 and the traffic is sparse enough that I can just ride. The road to day soon started to fill with trucks and that just leaves the outside lane, the traffic blasting past is doing 85, I am happy to pootle at 70. The noise from my exhaust is a scream that rivals any of the darkest black metal I have, who needs music when you have a Sports V-Twin. Clevedon is a quiet place, although the quiet was shattered by the roar of me turning up and heading for the sea front. Here once again came that gentle moment of the roll on, when the engine just pulls and screams its joyous heart out. Today I was heading along and the speed limit changed, however I was in slow traffic that suddenly cleared, the roll on from under twenty to forty in third gear is a gentle exercise in power and exhilaration. From a slow speed trundle to a blast in only a few metres and the pull from the bike pushing me into the foam of the saddle, the pegs into my boots and the feeling in my stomach that says I am doing something I truly love. The Surge of power and the Swell in my heart are twins and when there is one, the other is the right there too. They are inseparable. With that gentle twist of the throttle, the power just builds, tsunami like, from deep with in and the bike feels like it wants to gallop, but if the bike gallops, so does my heart. It is not the speed that makes it. You can do this and maintain the speed limit, it is the surge I am looking for here, that feeling of the bike getting ready to unleash the gallop. Carol was just about to finish work and I met her on the sea front, we parked up and watched the waves surge and swell back and forth. Even the sea knows what it feels like to gallop occasionally. Meeting Carol is a real pleasure, especially when she is about to finish work and we can head home together, she drives and I just hang back and follow on the SV. Once again we find a place where the traffic is suddenly light and the roll on comes out again and before we know it, we are rolling onto the motorway. This time the traffic was some what heavier and we spent a lot of time in the third lane before the sudden slow down for standing still traffic on the Weston turn off. I filter clear and head home, knowing that Carol was sat in traffic. Pulling up outside our flat, she is already parked up. She knows the back way home. 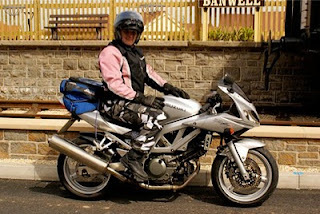 A quick change of clothes for Carol and I resume my place on the pillion pad, she rides that bike like it is a gentle pony, yet to me it feels like a stallion. We roll on down the hill and pull out onto the sea front, the traffic is light and we make it through to the lights. A familiar Scottish accent shouts out to me that I am being rather naughty, I should be riding on the front. This from the gentleman I met while out riding a while back. I know I laughed and there is why I love bikes. They make me smile, they bring me joy and us bikers, with our friendly nod to bikes going the other way, have out own club with it's own rules. Carol parked up on the Sea front in Weston, once again there were several hundred other bikers here and two we were sort of looking for. Another couple of lads from the SV forum came to say hello. These days on the sea front, it is just as likely that I am going to know some one as it is for Carol, all thanks to the Internet. Rick and Dan were good lads and no one had a ticket today. Dan rode up from Plymouth just for the pleasure of Weston Sea Front, not sure that he will do that again after the rain, but there you go. Rick was a local and the four of us wandered along and chatted, Carol snapping photos when she could, holding my hand when she could. Was it really so recently that two women holding hands in that loving way were considered wrong? If anyone today thought it odd, they never said. I just held my girls hand and felt her love. The ride back was a laugh, the guy on the Ducati that wanted a race was a bit silly to cut across the sand blown onto the road. With his full power crotch rocket, he pulled ahead and left us behind, only to promptly get stuck in traffic. Carol eased passed and with her usual grace eased her way to the front with no fuss. The looks on the faces of the Sports bike brigade was a mixture of cross indignation and the realisation that a girl had just shown them how to ride properly, my girl in fact. With a smile, we were gone, leaving Dan to head back to Plymouth and Rick following us for a cuppa. Weston Bike Night on the Sea Front in glorious errr... over cast skies. I spent two hours cleaning and waxing Sylvie, I even got out the chrome polish and gave the exhaust a good going over and when I was finished she was shiny, looked as good as new and her paint was silky smooth to the touch. She would gleam in the sun shine, if there were some. Why did I do this I hear you ask? "Because you are an bloody idiot Jayne!" is the wrong answer from you at the back! I did this for the First Weston Bike Night of 2010, a weekly event that is in place to raise Money for the Royal British Legion. All I had to do was wait for Carol to get home from work and get changed into her bike gear, for those of you who know Carol well, you will know that she cannot function unless she has a cup of tea in her hand, white, one and half sugars and not too strong. She knows how she likes her tea and it is almost certainly PG Tips. Anyway, as soon as she was through the door, I pushed her tea into her hand and she went and got changed. I checked Henry's oil level, knowing that he burns oil because he is old, worn and a bit of a banger. Carol rode Sylvie down and I took Henry, well as a senior Instructor, she has a lot of credibility to uphold and no one cares if I ride a crappy old 125. Well, nearly no one. Just before my part one test, we hired a local Instructor called Matt to train me up in the new test procedures. Matt is a brilliant instructor, working for Motag and with his good natured instruction, I passed first time. Well, when Matt saw me still on the 125, he had a word. "I trained you up to ride that bike over there (Sylvie), not that crappy 125. You should make Carol ride that one!" When Matt was a learner rider, his Instructor was a hard nosed local with a lot of years under her belt. Yes, he was Carol's former student and he was now doing her old job. His comments were taken as they were meant and Carol had a good laugh. So the time passed and more and more bikes turned up, but there was little sign of fellow Orger (a member of the web forum sv650.org) Nemesis, a nice young man who brought his bike over a while ago for us to repair and service. Finally his line of friends pulled in and found a place to park at the far end of the huge amount of bikes parked up. His face was not that of a happy chap, in fact none of the lads looked particularly happy, but then being pulled for speeding is never a happy occasion. Big commiserations to you guys, but three points and a sixty quid fine is not so bad when one is cruising at those hero speeds. Cue much stamping of feet and groaning. I do believe though, that I heard a muttering of an offer to pay Nemesis's fine by his kind and considerate cousin. Now that was rather thoughtful of him in my opinion and that instantly puts him up to the level of "Jolly decent chap" in the Jayne book of chaps! After a nice cuppa and a few more chats with various bikers, maniacs and patch club locals we all decided that the cold spring air was about to send us all home to our warm beds and blankets. Henry started again, with out the difficulty experienced earlier that evening and as always Sylvie purred into life. A final wave to Matt and we headed home for a nice bath and a pot of strawberry bio yogurt. Yes folks, I can reveal that while sat in a magma hot bath, there is nothing quite as soothing as sharing a chilled pot of yogurt with a beautiful naked woman. There are a couple of key people involved in this here blog thing and this would be a great place to introduce them to you all. Now many of you out there in Internet land may already know Carol, my wonderful life partner and one day wifey. Carol is the drummer with the band Oestrogenix and is working towards to the rock and roll life style, although with out the hotel room wrecking or cocaine binges! Carol has been riding motorcycles since before she was old enough to vote and in time became an instructor to new riders but progressed through the schools until she was training other instructors how to teach. She is a Cardington Assessed Instructor and has also taken her IAM Certificate, which means she really knows how to handle a bike. In terms of bikes Carol has had old British Triumph Chops, a Cossack combi, several Kawasakis, a couple of trikes and recently started riding a Suzuki SV650 with me on the back. As for me, I am somewhat less known out there in the world wide web. I was always a lover of two wheeled machines, but mainly of the human powered side of things. I am also a climber of some skill and have climbed all around England and Wales and a few bits of Europe too. I qualified as a climbing Instructor a few years ago and then went onto qualify as a Mountain Bike guide too. These days, I ride just for me and have a beautiful Giant mountain bike, but rarely climb anymore. However, just before I met Carol I rather impulsively bought a motorcycle and decided that I was going to learn to ride and pass my test, which sadly took me rather longer than I first anticipated. In case you are wondering what bike it is I bought, well it was a rather pretty Suzuki SV650S, in silver and I named her Sylvie. 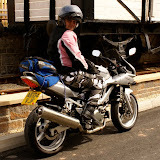 Sylvie is more than just a motorbike though, she is our friend and has something of a personality, which yes I do admit sounds a bit mad, but bear with me here. Sylvie is something special, she is first of all a sporty little V-Twin, not one of those nasty chuggy sounding cruisers, but a little 90 degree, growly sounding V-Twin. She likes to be well looked after and if we neglect her, she has her little ways of letting us know. She is also something of a hooligan and Carol has always taken great care not to have her up on the back wheel or front wheel too often, but sometimes Silvie likes to show off and I suspect that Carol enjoys it a little too! Sylvie is not alone in our garage and squeezed in next to her (and the various bits of junk that we do not have room for in our flat) is Henry, the trusty rusty Honda CG125. Henry is, to put it kindly, a bit of a banger, but being a Honda CG just keeps going and going and going. However every now and again, even he stops, has a quick sulk and then gets going again usually trying to keep up with Sylvie. When he was new, he was a lovely white, but now he is a battered splodged dirty white with the rust showing through in the odd place, but I would not be without him. I took my test on Henry and passed first time because he is just so easy to ride, a lovely little machine with good manners and a gentle heart. So these are the main players in our story and I am sure that in time it will progress in time. Make sure that you pop back every now and again and see what we are up to. Who knows, we might even figure out how to add a video to the blog and keep you enthralled with that too. Until next time, keep it shiny side up folks.